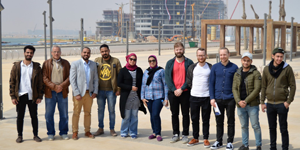 Under the auspices of Prof. Mohamed Gaber Abou Ali, the Dean of the faculty of Engineering, students of the joint graduation project between the faculty of Engineering (Mechanical Engineering Department) and the KTH Royal Institute of Technology (Energy Technology Department) went on a field trip to the New Alamein City on Saturday, 23 March, 2019. This PUA-KTH graduation project was conducted under the supervision of Dr. Norhan Ghoniem. In this trip, the students were acquainted with the on-site construction work and were apprised of the kind of data needed to be firstly compiled before embarking on the project. The students also enquired about many technical issues that could be of benefit to the project integrity and they were also conversant with the documents and plans required for establishing the New Alamein City. The PUA and KTH students were in company with Dr. Dalia Ammar and Eng. Amr Mamdouh.